I made us another rice salad! I’m sort of obsessed. If you haven’t noticed. This one, though has cantaloupe, which I love so much. It’s one of those fruits that we sort of have year round thanks to…Mexico?….but it’s REALLY good this time of year. This salad, like most that I make, is totally customizeable – you can switch out the rices/grains that you use, you can add a vinaigrette to make it tangy, you could throw in different cheeses….your choice! 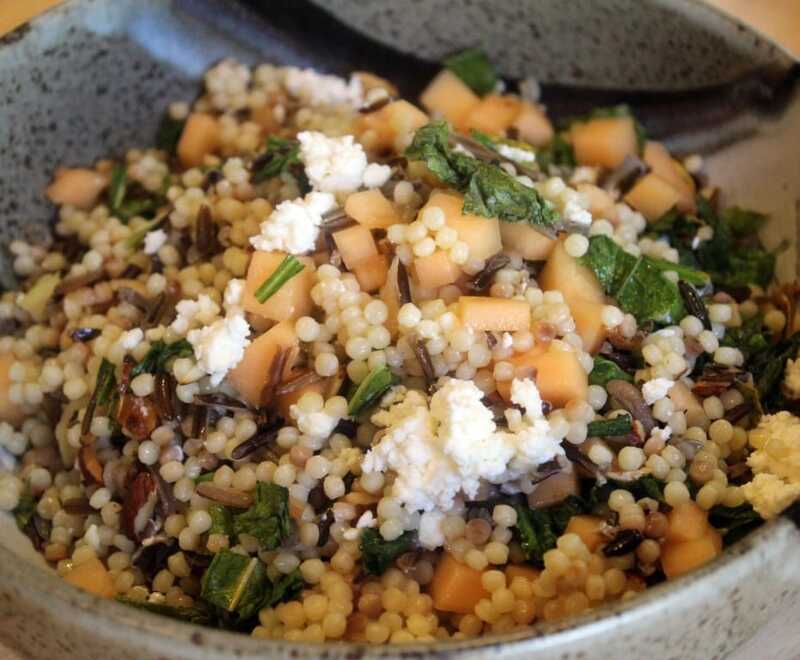 You need couscous, wild rice, canteloupe, kale or spinach, feta cheese, almonds, and pancetta. 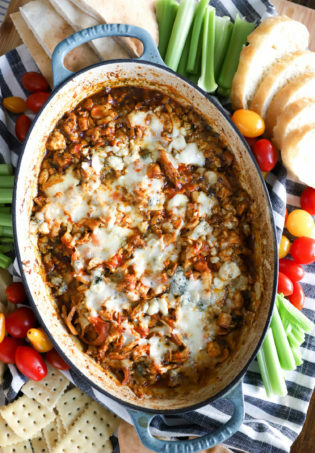 You could also use prosciutto or even bacon – a pork product makes this YUMMY, though! You’ll also need olive oil and salt, and that’s IT. 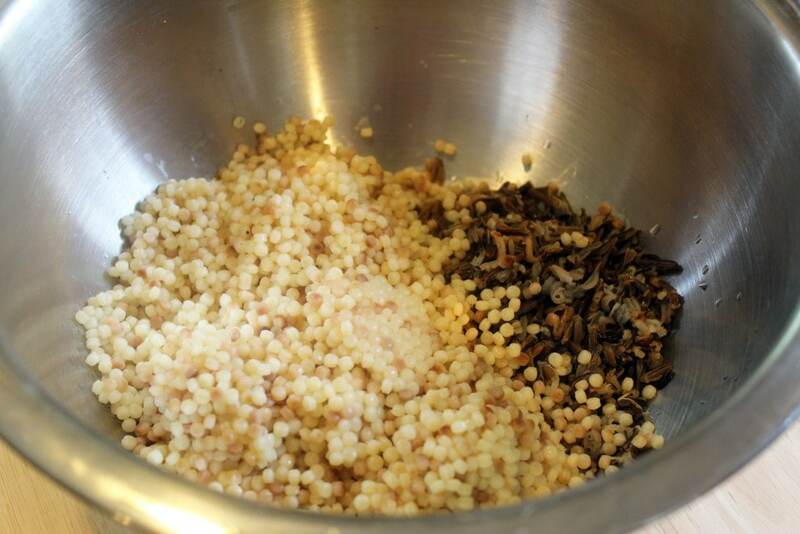 First, start the wild rice and couscous in two pots and cook them to package directions. When cooked through, let the rices (I know one’s pasta, it’s just easier to type) cool for a few minutes. While that’s happening, we’ll prep everything else! 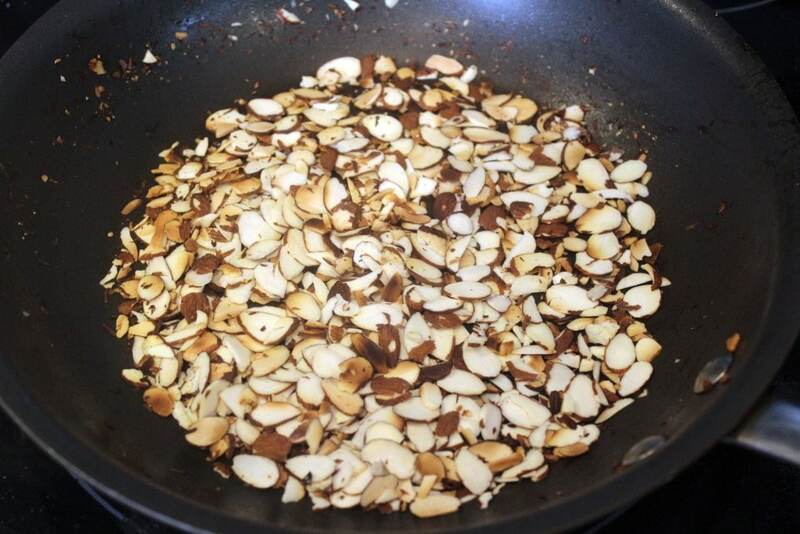 If the almonds aren’t already toasted, toast them in a dry skillet over medium heat. ….then into little cubes. 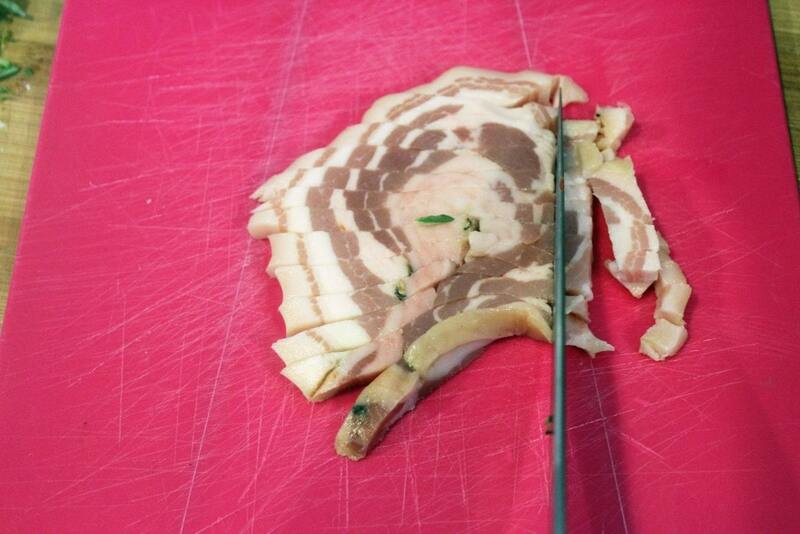 I’ve seen pancetta pre-chopped in stores, too – that would be great if you could find it! 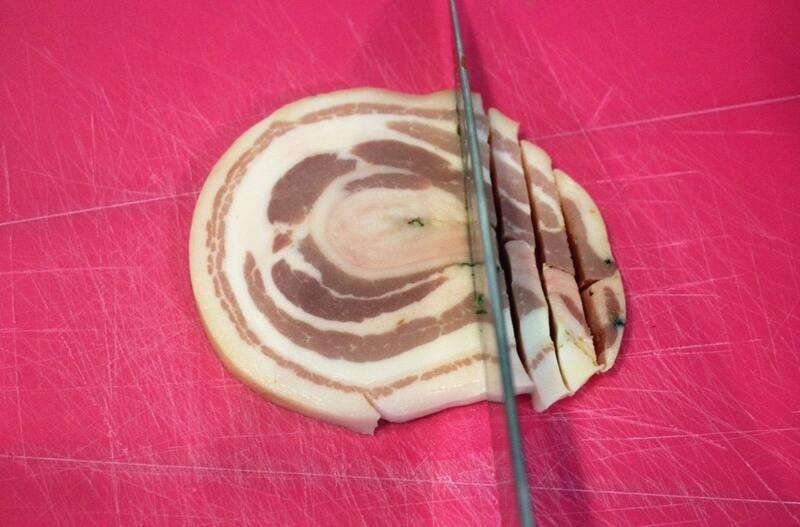 For this recipe, I used 1 1/4-inch slice of pancetta. It’s not a ton, just enough to give a slight salty meaty flavor to the dish. You could use more if you wanted! 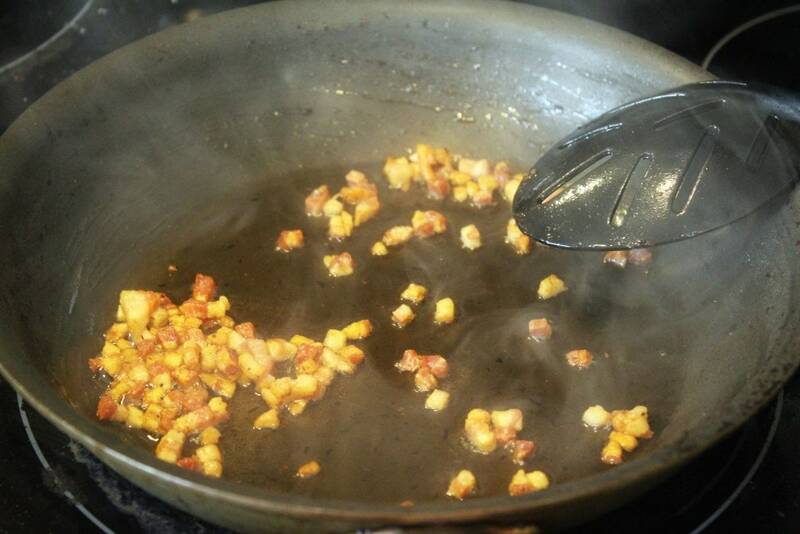 Use the same skillet to crisp the pancetta for 5 or so minutes until it’s golden. Like this. Drain the pancetta on paper towels. I used kale in this, because you know I love it raw so much, but spinach would be great too! 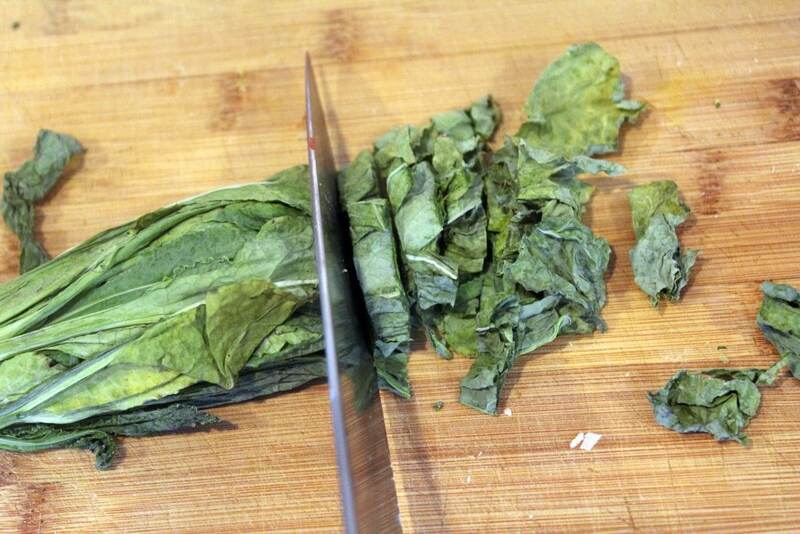 Thinly slice the kale, and set it aside. 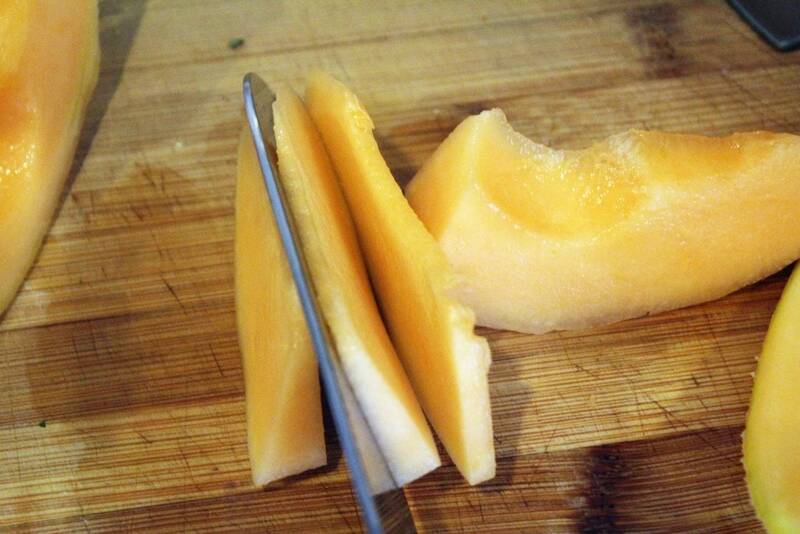 For the cantaloupe, we want a cup or two chopped. I used about 3 1-inch wedges. First, remove the peel carefully. Then, cut each wedge into thin slices. And the strips into little bits! Well done. 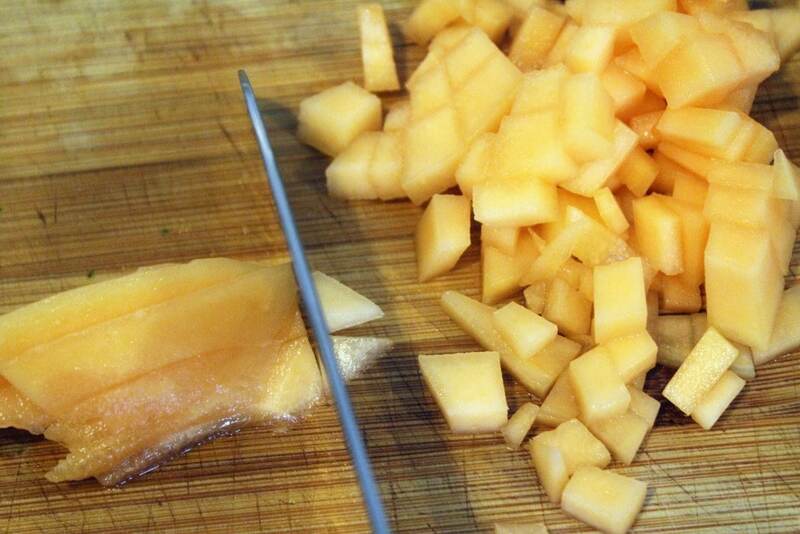 Chopping cantaloupe is kind of a pain. Don’t let it get you down! Now. We have cooked grains and rices or whatever you want to cook, we have chopped prepped stuff, and we’re ready to go! 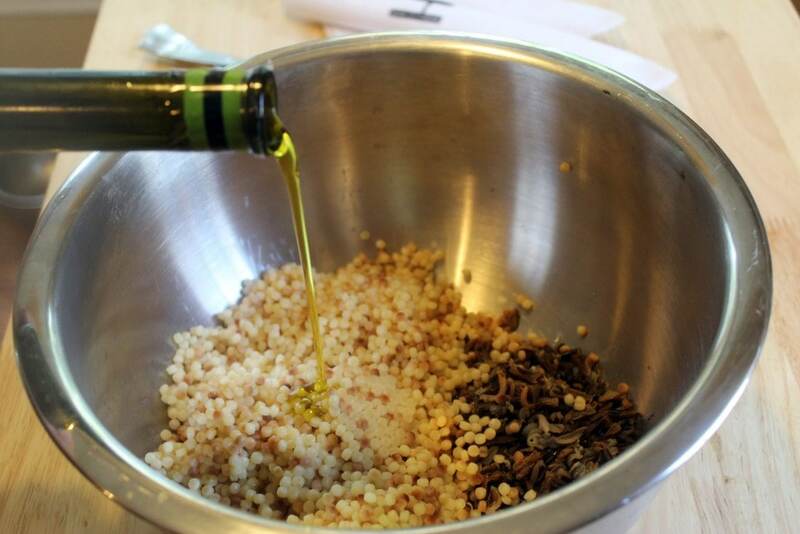 Drizzle just a bit of olive oil onto the couscous and rice. OMG A FLAVORED OLIVE OIL WOULD BE AWESOME HERE. Use that if you have one! 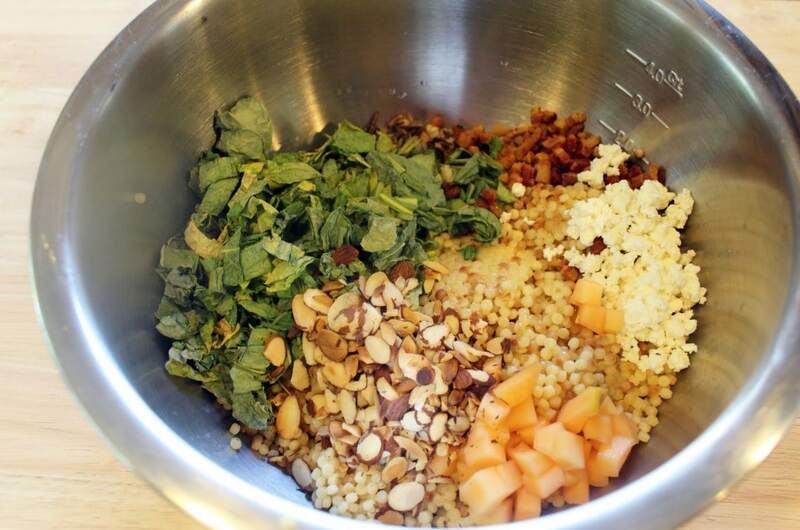 Then, add the pancetta, cantaloupe, kale, half the feta, and almonds to the bowl. 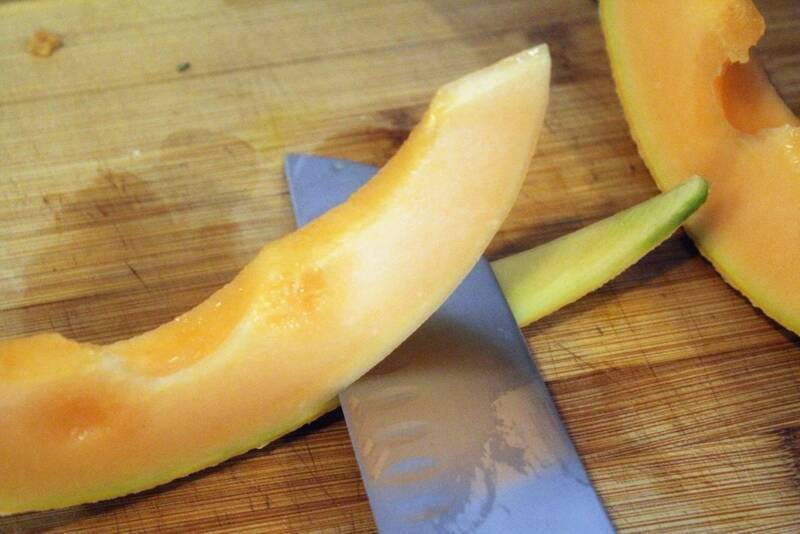 Insider tip: the feta and cantaloupe can get a teensy bit soggy, so I like to add them right at the end. The rest of this can be made wayyyyyy (2 days or so) in advance! Stir everything together, and taste. Add as much salt as you’d like. That’s it, kids! Top the salad with the remaining feta, and we’re good to go. 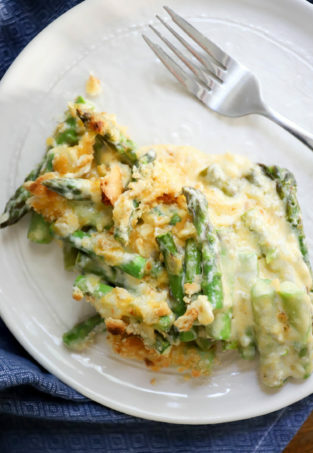 This is a great side dish, and tomorrow I’m going to show you a few fun additions to make it a quick and easy meal. I love all the ways we can modify this, too – different veggies, nuts, cheeses….wouldn’t it be great with barley or quinoa? 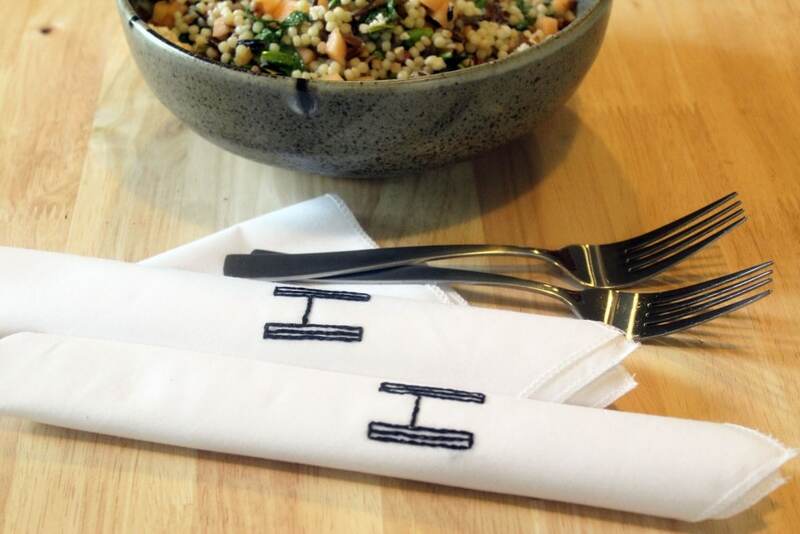 ALSO LOOK AT THESE NAPKINS. They’re from my friend Rebecca – she gave them to me and Jay at our wedding shower. I’m scared to use them because then I’ll have to iron them, so for right now they’re my fav new blog prop. I have issues. 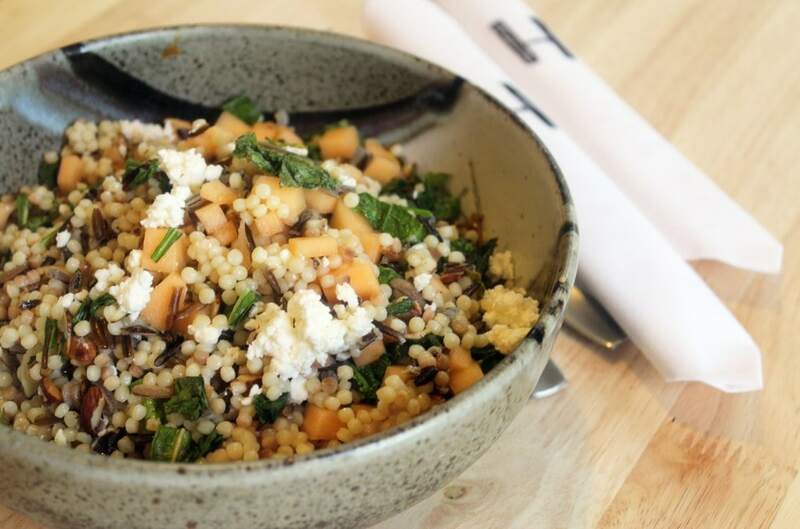 The cantaloupe with the salty pancetta and cheese and crunchy almonds and greens is SO good in this, guys. 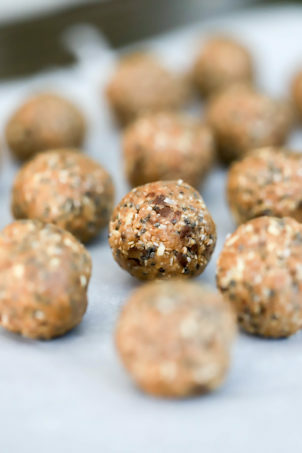 It can be served warm, room temp, or cold, so try it a few different ways and see what you like best. 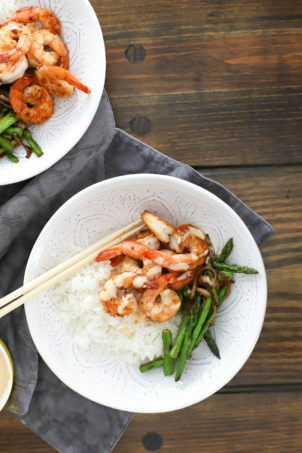 Want a variation with chicken? 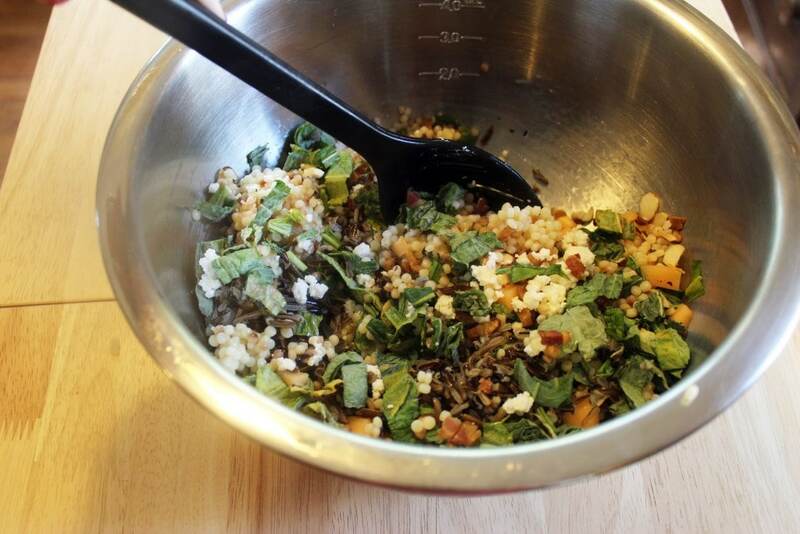 Combine the couscous, wild rice, pancetta, kale, and almonds in a large bowl with the olive oil and a sprinkle of salt. Taste, and season more to your preference. 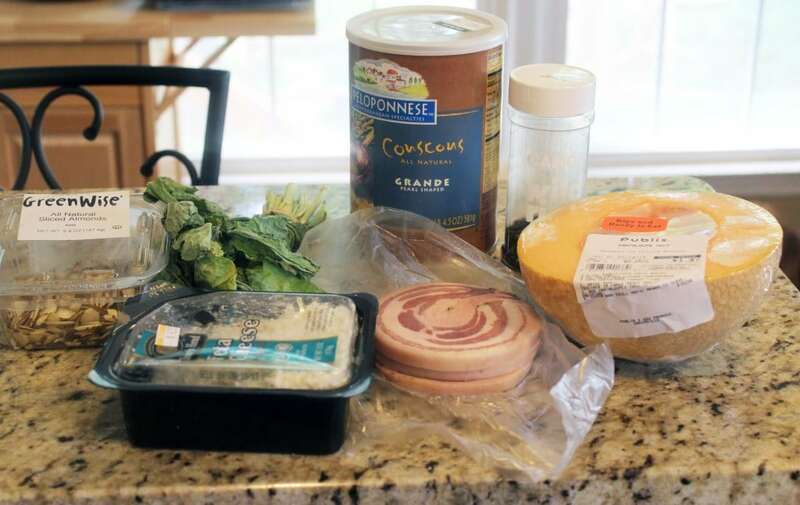 Right before serving, stir in the cantaloupe and feta cheese. Enjoy! 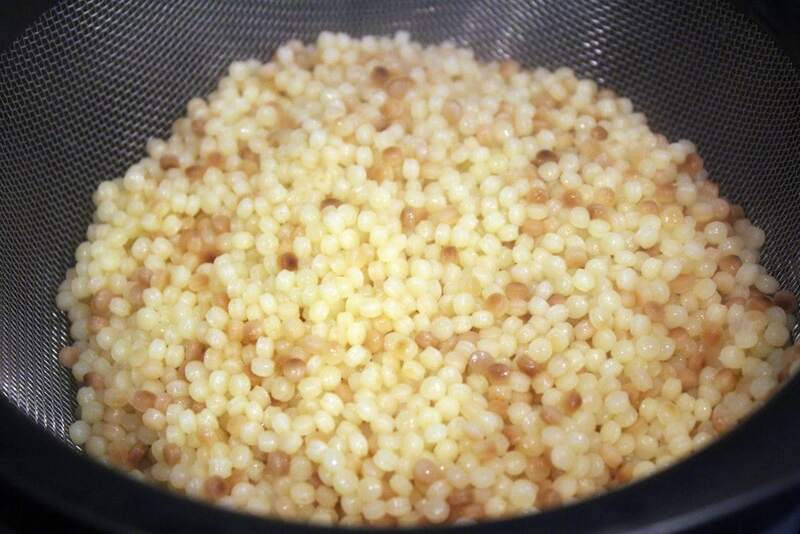 Timeline: I start the rice and couscous in two separate pots. 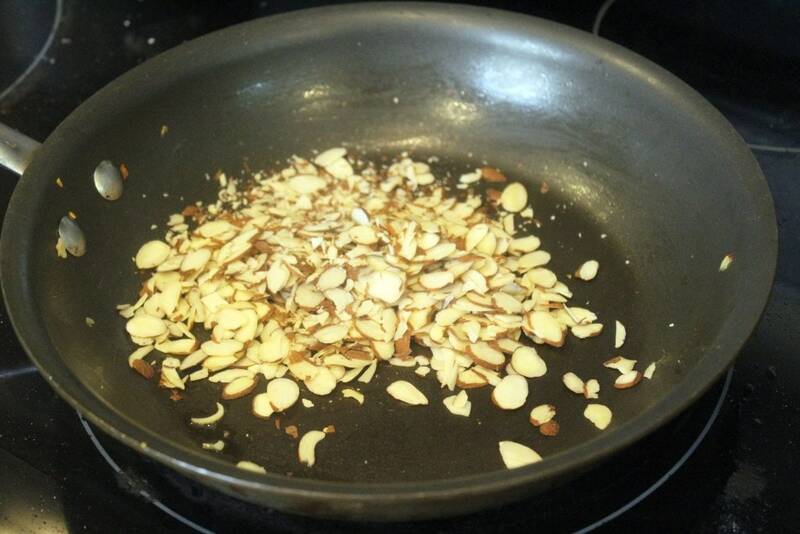 While that's cooking, I toast the almonds in a large skillet. 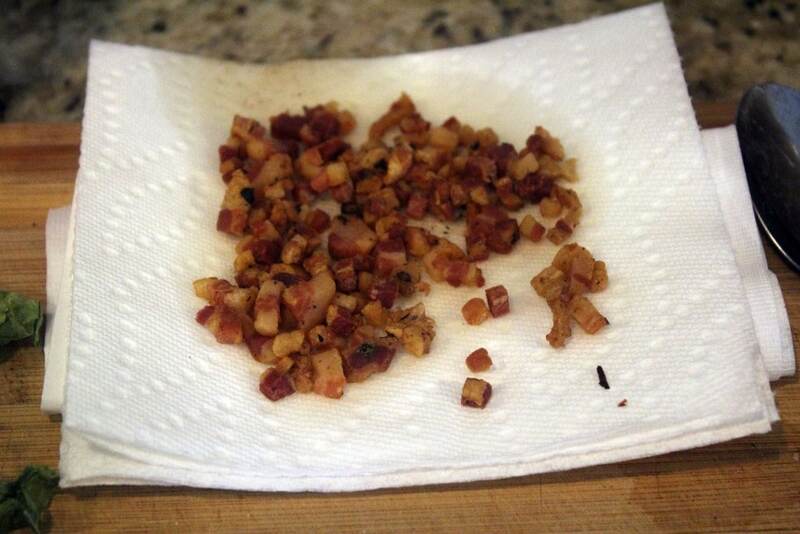 Then, in the same skillet (almonds removed), I cook the pancetta until crisp and let it drain on paper towels. Then, I prep everything else. When the rices are cooked and cooled, I combine them with the kale, almonds, olive oil, and pancetta. Right before serving, I add feta and canteloupe, taste for salt, and serve.